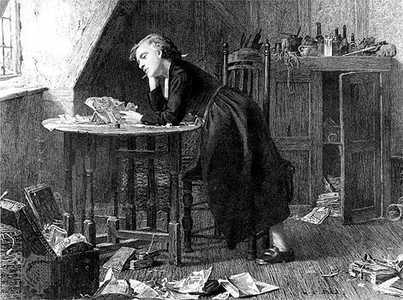 L’Ecriteur Maudit: Thomas Chatterton reflecting on where his next meal’s coming from. According to a survey of almost 2,500 working writers – the first comprehensive study of author earnings in the UK since 2005 – the median income of the professional author in 2013 was just £11,000, a drop of 29% since 2005 when the figure was £12,330 (£15,450 if adjusted for inflation), and well below the £16,850 figure the Joseph Rowntree Foundation says is needed to achieve a minimum standard of living. The typical median income of all writers was even less: £4,000 in 2013, compared to £5,012 in real terms in 2005, and £8,810 in 2000. Shock horror! I hear you cry. Why is this news? Isn’t our image of the author that of the perennial hungry hack, scribbling away in a garrett, forced to turn his hand to penny dreadfuls, pulp fiction, and other sources of income to feed himself as he dreams of composing the Great [Insert Country Here] Novel? It’s as true of Thomas Chatterton (admittedly a poet), as it’s true today. And it’s not just the case in the UK. I happened to read a book called Literary Brooklyn the other day, in which the likes of W. H. Auden, Norman Mailer, Henry Miller, Hart Crane, Thomas Wolfe, et al. slum it in the borough (dreaming of the bright lights Manhattan), and complain about their rent and the paucity of their royalties. Their main concern was putting food on the table; literary greatness wasn’t (yet) feeding the electricity meter. It’s a fact that all of us in this industry have to face: authors have very rarely made a decent living from their work. Professional writers (who may or may not be “authors”)—can earn money from magazine articles, ghostwriting, copywriting, freelance editing, and teaching to supplement their meager royalties. Some authors, like Wallace Stevens, worked in other careers; most now work at universities. All of which means that those scribblers who are foregoing food, not paying their bills, and avoiding life and its pleasures awaiting their huge advances and hefty checks are deluding themselves if they (a) believe that this is a viable way to conduct a career or (b) that it was somehow easier in the past. The moral of the story? Don’t give up your day job until you’re assured of a sound income. This entry was posted in Editing—Publishing—Writing, Writing and tagged American Authors, Brooklyn, English Authors. Bookmark the permalink.